The pound slumped against the world's major currencies this afternoon as investors bet that the UK is set to crash out of the European Union without a deal after Theresa May revealed the extent of the 'impasse' at the Salzburg negotiations. The Prime Minister hit out at her EU counterparts for lacking 'respect' as she vowed defiance despite being ambushed at the summit when counterparts condemned her Chequers plan. In a statement in Downing Street, she admitted that the two sides were still a 'long way apart' and at an 'impasse'. But she warned that the leaders were 'making a mistake' if they thought she would back down on her red lines. 'As I told EU leaders, neither side should demand the unacceptable of each other. We cannot accept anything that does not respect the result of the referendum,' she said. 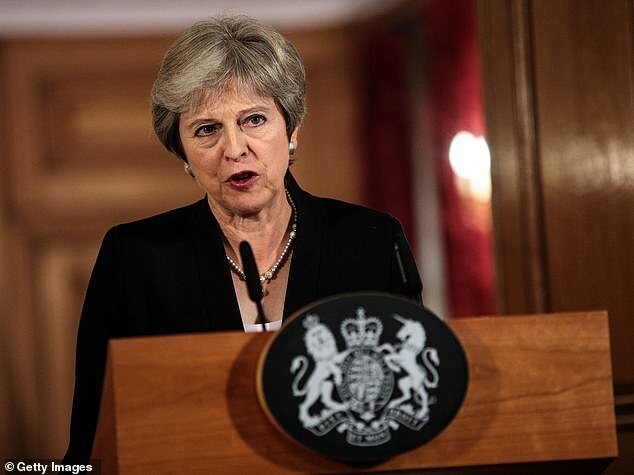 She warned EU leaders to come up with new alternatives to her Brexit proposals if they are to break a deadlock in the talks. May said she could not agree to any deal which treated Northern Ireland differently to the rest of the United Kingdom. The EU insists that there can be no hard border between the British province and the Irish Republic, with Northern Ireland remaining in the bloc’s customs union or effectively establishing a border in the Irish Sea if no alternative deal is reached. Hamish Muress, currency analyst at OFX, said that 'the pound has shown its vulnerability to Brexit headlines'. The pound has now given up gains it made this week on the back of a higher-than-expected inflation figure and strong retail sales data. 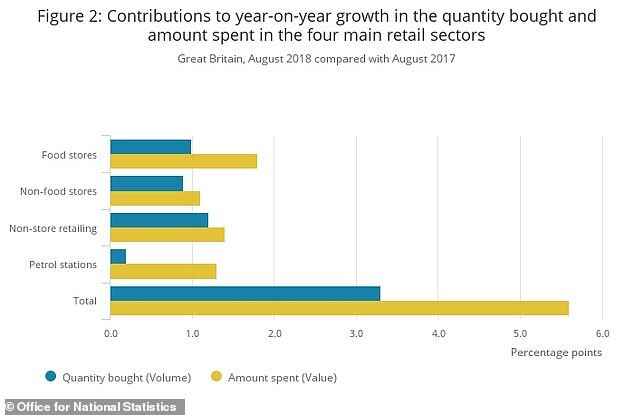 Official figures yesterday showed British shoppers defied Brexit concerns to continue their spending spree into August.Retail sales jumped 3.3 per cent in August compared to the same month a year earlier, with households spending more on food and household goods than last summer. That spurred the otherwise volatile pound, which rose by a cent against the dollar to 1.321 and by half a cent against the euro to 1.130. Sterling also rose earlier in the week when inflation data showed prices rising faster than had been expected. That saw traders shortening the odds on another rate rise before Brexit and buying the pound. The Office for National Statistics retail data showed retail sales rose by 0.3 per cent in August from July, which was significantly better than the 0.2 per cent fall that a Reuters news agency survey of economists had forecast. Sales of household goods jumped by 4.5 per cent while other non-food stores enjoyed a 2.8 per cent rise, however food sales fell by 0.6 per cent and clothing fell by 1.9 per cent. The last three months of summer from June to August saw sales rise by 3.4 per cent compared with the previous summer, with food and household goods stores doing well in the warm weather. Spending online continued to increase to reach a new record proportion of all retailing at 18.2 per cent, while spending in department stores also reached a record proportion at 18.4 per cent. 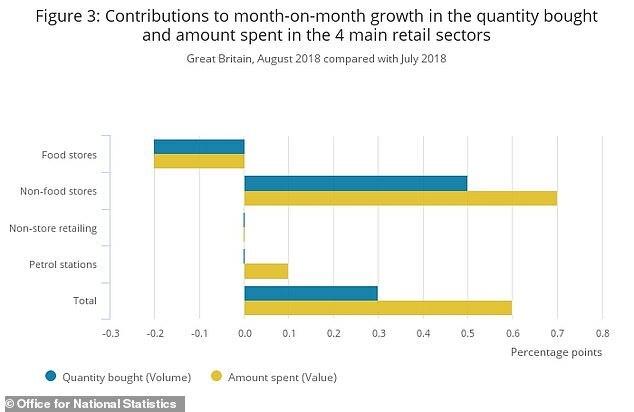 ONS senior statistician Rhian Murphy said: 'Retail sales remained strong in the three months to August, with continued growth across all sectors. 'Food and household goods stores particularly benefited from the warm weather when compared with last summer. Food sales were well up in August on the same month last year, as were non-food sales. But food sales were down in August compared to a hot July. Tom Stevenson, investment director for Personal Investing at Fidelity International, said that this week’s data increases the Bank of England’s interest rate dilemma, 'and, at the margin, make a rate hike later this year more likely'. 'However, the Bank of is likely to remain focused on the high degree of Brexit uncertainty and tread carefully,' he added. 'Looking further ahead, the pain for bricks-and-mortar retail is far from over as the growth of e-commerce continues.